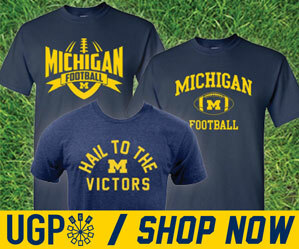 With title hopes still on the line, can Michigan reignite the momentum? We've reached a pivotal moment in Michigan's season. And given the loss to Iowa and injury to Wilton Speight...the pivotal moment it would seem. Every season has one. For Michigan, these next two games are going to define how successful 2016 can be. Either Michigan keeps moving forward and sets themselves up for a run at the Big Ten and national titles, or they regress and settle for another good, but not great season outcome. After a 9-0 start...rolling through most opponents like a warm knife through butter, but the loss to Iowa still stinging, Michigan is now faced with trying to live up their #3 CFB Playoff ranking and the lofty expectations that come with having Jim Harbaugh as your head coach. Michigan's loss to Iowa didn't really alter the overall trajectory of the season...Michigan still has to win out for a Big Ten title game appearance. But it was a loss to an inferior team that in all aspects should've been a win. In losses like this, it calls everything into question. And when your quarterback gets injured in the process, the scrutiny only intensifies. Michigan's first loss of the season did take place at an opportune time though, when 4 other top 10 teams also went down...some to lesser opponents such as Clemson's loss to Pitt and Washington's loss to USC. So the overall immediate impact was negligible. On paper, and in the latest college football rankings, Michigan still appears to be full-steam ahead towards the Big Ten championship game and a shot at the college football playoff. They still control their own destiny as you no doubt know by now. But games aren't played on paper...as we found out in Iowa City last week. To truly know if Michigan is "back", these next two games will certainly give us that answer. Indiana is not going to be a gimme...especially if Michigan is starting John O'Korn for the first time in his Michigan career. Ideally, Michigan's defense should be able to mitigate any offensive struggles in a game like this. Vegas has Michigan a comfy 3+ score favorite...just like they did a week ago. 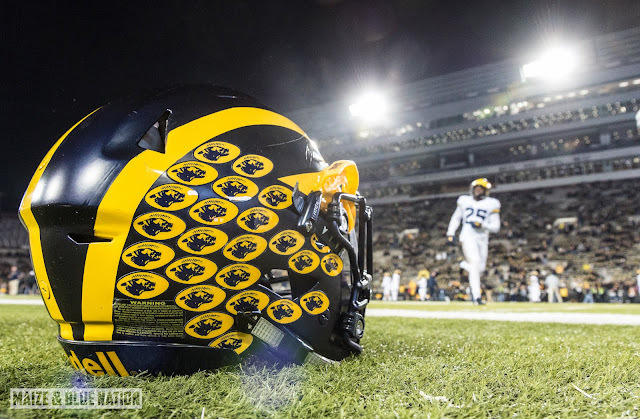 And even with Indiana bringing their unique brand of "chaos team" football to Ann Arbor, you just have a feeling Michigan should be able to right the ship enough to pull out the victory. Which sets up the showdown in Columbus. You just knew it was going to come down to this, right? From the moment Harbaugh was hired to the 10-win season a year ago to the bowl win to the 9-0 start this season...Wolverine fans have enthusiastically proclaimed that "Michigan is back!" And while it's nice to beat Michigan State while their down and roll through the majority of the schedule rather easily, there's no doubt that in order to truly be "back", you have to take down Ohio State. Michigan was crushed 42-13 a year ago. This year, it appears that the 9-1 Buckeyes are rolling against after their loss to Penn State and ensuing albeit brief mid-season slump. They should be at full-power when Michigan rolls into Columbus next Saturday. Back in the preseason, I suggested that the best-case scenario for this season was for Michigan to run the table and bring home both the Big Ten and national titles. And in week 12, sans the undefeated season, both trophies are still on the table for this team. Either this season ends with a glorious title run after defeating Ohio State...or it ends with 2 or 3 regular season losses and a whole off-season full of questions and doubts.